I am shattered, I had one of those days which seems to go on forever and I haven't stopped once all day! At some point through the day Ebi-kun and I did this cool experiment that my mom told me about. You will need a bowl of milk, some food liquid colours, we used red, blue and yellow and a drop of washing up liquid. 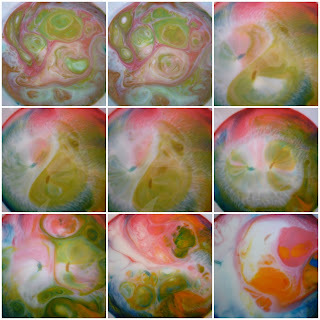 and watch the colours move and swirl by themselves, these pictures were all taken in the same experiment, the patterns are amazing. You need to be quite patient because it is a bit slow to get going but once it does... so pretty! no! he did want to stick his finger in and swirl it around to speed it up! Very nice! Found you on Crafty Crow.